I wasn’t always this sophisticated. I remember when I was maybe fifteen; it was morning and I was standing out waiting for the school bus. I glanced to scrutinize my outfit. I didn’t dress a whole lot better back then, but I certainly worried about it a lot more. That was when I saw them–maybe ten or eleven dark brown hairs that I’d missed while shaving. They were on the inside of my ankle, like a furry cuff. Like a Friesian fetlock. I simply could not be seen in such blinding disarray. It was totally mortifying. Then the light on my fetlock went into shade and the school bus door opened. Not many of us remember small ordinary things. Scientists say the brain remembers an incident if our emotions color the event. It makes sense, looking back at memories is a parade of special occasions. Some of us have fewer memories because we didn’t attach our emotions. Some of us are haunted by trivia because we have emotional runaways. Naturally I remember this incident rationally because it meant any possibility of dating would be put off until after high school. Because teenage boys are so fastidious about personal appearance. Snap out of it. I was ridiculous–squeamish about ankle hair and in the habit of being my own worst enemy. If horses hadn’t taken me into their care, I might be whining about chipped nail polish right now. Being squeamish is a luxury that gets in the way of mucking, cleaning messy leg wounds, and getting mice out of the grain bin. I gave it up. I can’t imagine what would qualify as totally mortifying at this age. For crying out loud, if I’ve been known to do a quick sheath cleaning in the middle of a riding lesson. Alas, I’m not perfect. Last fall I had foot surgery, with a heaping side of squeamish. It was all I could do to let myself be wheeled in to the operating room where the sharp knives are kept. Once I was home, I was afraid of my own foot, and afraid of the pain meds; they made me sick and crazy. And if you aren’t squeamish about physical therapy, you’re doing it wrong. I’m sure my hair was a mess, too. So what? At the same time, I noticed my compassion for chronically lame horses increased. I wondered about what it would feel like to have this kind of chronic pain, but be a flight animal. To feel the fear of predators, and then on top of that, the fear of knowing that there was no escape. So, I started taking lessons from a new foster here at Infinity Farm. She’s a donkey so old we make jokes about carbon-dating to find her age. Her neck has broken over into a slouch and there’s a hitch in her hind. She has no teeth and a few seasons of hair, felted into a crusty shell over her body. She’s squeamish about people, but that’s just sound common sense. It had been “Donk’s” job to protect calves from coyote, but the cattle left the land a decade ago. It was just her and a lame gelding, with no way to run. Did she stand her ground and bray when the coyotes came? Her voice is still strong. She’s prairie tough but being “rescued” nearly killed her. Change is just so very hard. At first she didn’t eat or drink. She was frail and when I came close, she’d turn her wobbly backside to me and kick… clearing the ground by maybe four inches. She stood outside in storms and I thought she might die. She had earned that right at her age. Donkeys are funny about water containers but she finally drank out of the third one I tried. I brought her an overripe pear and she carefully considered her options for a few days. Then she surrendered to change. It was crazy; there was mush and Thrive feed a few times a day and soon her belly appeared. She was terrified if hands come near her ears, but she had to admit those same hands did a great job of scratching. Years of hair came off. Like me, she’s still touchy about her feet…and she can kick as high as my knee now. But she’s decided to have an open mind; she even asks to be turned out with the home herd. This ancient donkey thinks my ratty little farm is the most elite equine facility in the world. Perception is really all that matters. 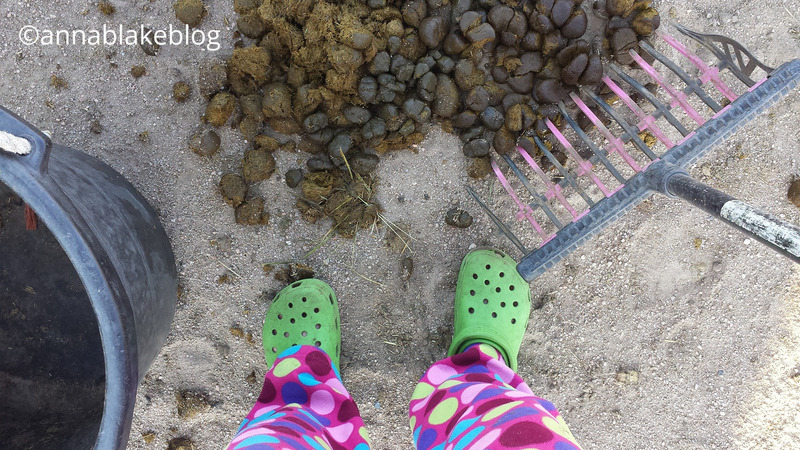 By the way, I don’t recommend Crocs for mucking. I’m in favor of boots for barn wear; I just can’t get my foot in any. I was a size 10 before. Now I’m a size 10 on the right and size 10, wide and thick, on the left. It’s been the better part of a year since surgery and the swelling is gone. So are all my shoes and boots; I’ll never fit in them again. I’m gratefully back to training for long hours; the work I love. Surgery helped, but like most of us of a certain age with chronic lameness, it’ll never be as good as new. This week I’ll go boot shopping again, but this time I’ll try the men’s department. Have you taken a look at their feet? I’m sure something will fit. Yes, I’m turning into one of those women. So it goes, with thanks the equine gods for rescuing me once again, from squeamishness and superficiality. And women’s shoes. On the high side, I’m always looking for a mentor and I think I’ve found one. She brays like the roar of a lion, she never misses a meal, and against all odds, she’s curious about her future. Love this!! Hope you find that special boot that fits. Meanwhile, I like those crocs! Thanks, Billie. They leak a bit, but clean up well! I sure can relate😂 Suffering with a terrible sprained ankle as I write this and at first glance I thought the picture was of me😂😂😂Have a safe and Happy 4th Anna! Awk! Heal quickly, my fashionista sister! A good holiday to you as well. What a magical transformation a little love can operate on a sensitive animal. I can so relate to this blog has you well know! Glad your foot is OK allowing you to be a “full you” again. Keep on swimming Dory! Thérèse, She is blossoming in plain view. What a heart! Best wishes to you, too. I have been wearing men’s Ariat’s for several years now because they have room for my “old Lady” feet. I love them and wish I could wear them every where. If the D’s are not wide enough, have your boot store order E width for you! Thanks for the tip, just what I was hoping to hear. I love those Ariat sneaker/boots. Thanks, Kati. As always – you hit the spot! The one that we all have been in at one point or another. Like you, I cant concern myself with “chipped” nails or fashion. Honestly, who in the world contrived these 4 inch heels with those ungodly pointed toes! Cannot imagine forcing my older, revamped feet into them – for what? Just remember my granddaughter when she used to “do” the barn (where I used to board) she wore flip flops with fleece lining – and this was in the winter!!!!!!!!!!!! She also was young (you figured that, right)? Love the donk stories – shes right – she IS at the best equine facility she could ever be!! There is a certain nostalgia to be young and foolish again… for about 5 seconds. Thanks, Maggie. This kid also now has a rescued donkey named Jenny! One ear droops – no idea what was done to her before Beck got her – but she says shes getting better about being “caught” for the farrier etc. Of course, her feet were in horrible shape too (not as bad as the “elf feet” I’ve seen in pictures) having a good farrier (gentle) has helped her too. Jenny LOVES baby animals – as in sheep? Has adopted several all by herself – and the actual mothers had to adapt!!! I love the story about the donkey. And good luck finding a pair of shoes/boots. Getting stepped on would hurt. Trust me! I have 5 screws, a lever, and a fencing staple in my foot! I’m VERY careful and I want to find some protection! Thanks, Judy. What a wonderfully inspiring read this morning. I am at my folks doing some chores and caregiving, and my black rubber wellies and boxer shorts are my work attire. It is my favorite part. Oh my, very attractive! Thanks for the visual! I see no problem! Your pants pick up the color of your Crocs. Voiià! A great combination. If I manage to find some sort of boot, I will have to sacrifice… But for now, I match! Thanks, Sharon. I love Anna Blake’s writing. Enjoy! Love this post. And all the others. I just recently discovered your blog (where have I been???) and ordered your book. Can my horse and I come live with you? Thanks for ordering the book, I hope you like it! Sure, come on over. I warn you, it’s donkey-loud around here! Thanks, Janet. So look fw to your blogs and photos! Usually I both laugh and cry and that is so important! Oh jeez, matching shoes and bag. Your mother would be pleased? Thanks, Ev. I notice that thresholds look bigger as they are approached, and tend to recede quickly once they are in the rear view. If it’s true we can only get worse, we’ll never know! Thanks, great comment. If that donkey isn’t proof of indomitable life forces then I don’t know what is. Her willingness to look forward is positively inspirational! Yup, that’s what I think. She amazes me with her try… thanks, Laurie. Donkeys are such wonderful creatures in my opinion. They truly are fully sentient and intelligent… Thank you, hope you have donkey time in your life. Fleece is good if it isn’t shedding season! Then I look exactly like the last horse I stood by. I can still squeeze my foot into the muck boots…I think of them as barn slippers in the winter. Thanks for commenting, to the other side of the world, Christine. “Being squeamish is a luxury that gets in the way of mucking, cleaning messy leg wounds, and getting mice out of the grain bin.” Last night we had a cookout at the barn. When it started to rain table food and all (including horses) were moved into the barn aisle. No thought about hay, dust, animal hair or manure. The horses were part of the party. I wonder if my non-horse friends or colleagues would have been “grossed-out” but this? Hehe, maybe. Sometimes I get visitors here, who nervously watch the ground for poop and comment that it must be so much work. I try to see it through their eyes, what ‘work’ they see. I’m with you, and wondering if next time you all just set up in the barn, rain or not, because it’s friendly in there. Thanks, great comment. Ah yes – barn parties! Who cares about hay or horse hair or manure – it just adds to the total flavor! And yeah, my non-horse friends did “look at me funny” when I mentioned the parties. Squeamish much? Nope. As I have said many times before – how I miss the barn – horses & people! Anna, you and your followers are my kind of people! I was famous, back in the 70s & 80s, for my barn coats with their pockets hanging off due of equine feet being planted in them. Also for spreading hay seeds liberally around everywhere I went. Never have been squeamish, I remember “saving” dead bats in jars till they crawled with maggots. My mum didn’t care for them in my bedroom at all. Strange, huh? Thanks to you all for another great start to the day. Shelagh in Vermont. I confess my love of animals is very weak in the area of bugs and reptiles… but if you look at my sheets… well nevermind, don’t. Too much information… Thanks, Shelagh. OK now I want a donkey 🙂 My barn clothes are always very functional material, super comfortable and not fashion forward. I have a 25ish year old pair of summer barn chore shorts i totally love and would buy multiple pairs if Columbia Sportswear still made them. I’m even considering getting out the sewing machine &trying to copy them – just for barn wear, I’m that attached to them. I try not to think about the list of things I love that they don’t make anymore… and I am in between perfect shorts. Thanks Karen. If you have a local donkey rescue, go take a visit. They are totally not what we expect… just so much more. Oh Anna I’m so moved you have a new rescue/foster donkey, and the “after” photo is absolutely stunning! Great work! I’ve been taking my 3 out on grazing walks all at the same time and it’s a little like herding cats. But we have such fun. Also fun is your commentary on fashion-forward mucking. Just one of the many benefits to hanging out in barns. I feel so very fortunate to be able to do so. Julie, the image in my mind of you “walking” three donkeys… well, those of us who know donkeys….I’ll keep my chuckles to myself. Yes, bad pajama pants and donkeys are just two things to love about a barn! Thanks, Julie, for the snapshot of the four of you working at happy chaos.